Students from Calvin College and Michigan State University attending the DMLC President’s Luncheon sponsored by Aflac. 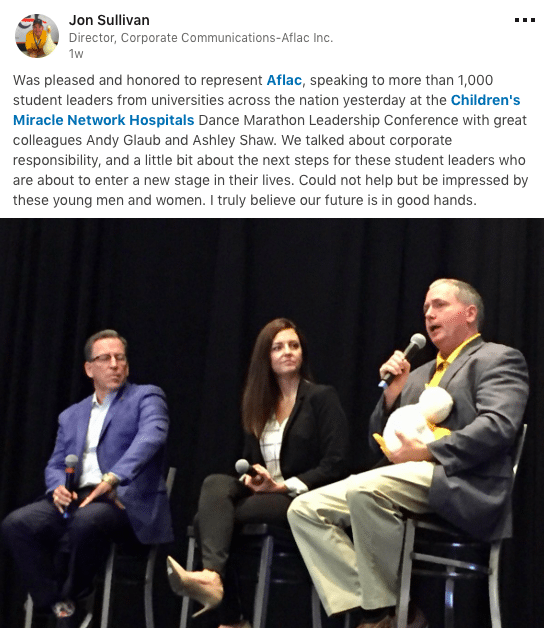 In 2018, Aflac joined the Miracle Network Dance Marathon movement as partners for the annual Dance Marathon Leadership Conference (DMLC). DMLC fosters collaboration by sharing resources, best practices, and trends in peer-to-peer fundraising for participants involved with Dance Marathon programs at over 300 colleges and universities throughout North America. This year, nearly 1,000 students, university administrators, and hospital foundation staff members gathered in Indianapolis, Indiana to learn and network–all with the aim of raising funds and awareness for local Children’s Miracle Network Hospitals. DMLC provided an excellent opportunity for Aflac to launch this new phase in its partnership with CMN Hospitals and connect with the student leaders in attendance. As part of their commitment to DMLC, Aflac sponsored the President’s Luncheon, which provided them with a chance to engage with the Dance Marathon students who are responsible for leading their organizations on their respective campuses. Buffy Swinehart, Senior Manager for Aflac’s Corporate Social Responsibility program, and Margaret Price, Territory Recruitment Consultant,also from Aflac addressed the audience with a clear message–follow your dreams and find an opportunity to make an impact when you enter the workforce. 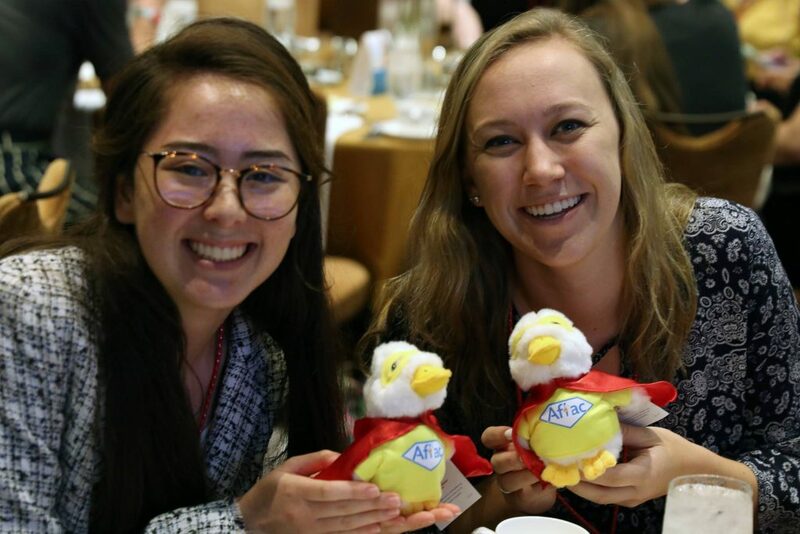 They shared the history of Aflac’s involvement with children’s hospitals, highlighting Aflac’s childhood cancer campaign, and demonstrating to students how they can make an impact and stay connected to charitable causes in their communities after their graduation. Aflac’s Buffy Swinehart and Sean Kelly demonstrate the use of the My Special Aflac Duck with students at DMLC. Executives from Aflac, including Andy Glaub, Senior Vice President and Director of US Sales, Ashley Shaw, Regional Sales Coordinator for Indianapolis, and Jon Sullivan, Director of Corporate Communications, took to the stage for a panel discussion on corporate social responsibility. They shared that philanthropic work does not, and should not, stop for students when entering the workforce. They encourage student leaders to take the same enthusiasm they’ve gained from their involvement in Dance Marathon and apply it to their careers. The students were challenged to find companies that are committed to making an impact in their local communities or use their experience from Dance Marathon to help their employers find opportunities to give back. During this event, Aflac also premiered the My Special Aflac Duck, a social robot duck that will help children coping with cancer throughout their treatment process. While the My Special Aflac Duck will officially launch in September, these students were one of the first audiences to be able to interact with this amazing new technology–one that will delight and comfort pediatric cancer patients at local CMN Hospitals. Aflac is excited to continue their support of the Dance Marathon movement and will be sponsoring a number of programs in the 2018-2019 school year. Led by Michele McMullin and Sean Kelly from Aflac’s Corporate Sponsorships team, the partnership will demonstrate Aflac’s commitment to helping student leaders continue their passion for supporting the pediatric patients and their families at local CMN Hospitals. It was so great to hear from Aflac this past weekend at #DMLC2018 about the initiatives and strides they are taking to improve the lives of children with cancer. We are extremely excited about the My Special Aflac Duck project they are launching this fall and can’t wait to see the ducks in action in the future. Additionally, we are so grateful to Aflac for everything they have done to support our program as the presenting sponsor in 2018. We truly couldn’t have achieved the success we did this past year without their support. We look forward to continuing to improve the lives of children together for years to come.